Treasuries are taking a shellacking on expectations that the GOP’s tax package will cause the economy to boom and inflation to leap. I have serious doubts about this but am keeping an open mind. 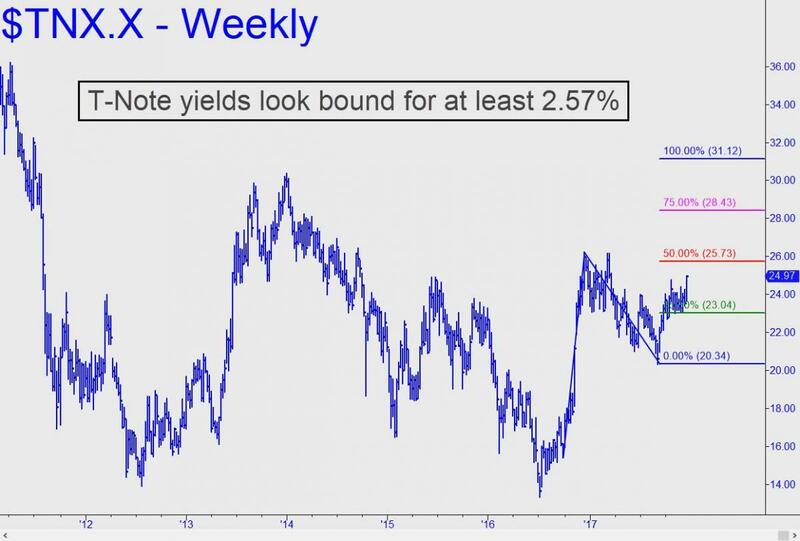 Regardless, the chart shown makes a strong case that rates on the 10-Year Note are headed up to at least 2.57%, or possible even 3.11%, in 2018. That would be the sharpest increase we’ve seen since the bull market in stocks began in 2009. It would still be well within the limits of a corrective move in a bond bull-market that has been running for nearly four decades. If the crucial ‘midpoint’ resistance at 2.57% were to be exceeded by two consecutive weekly bars, I would infer more upside is coming to the 3.11% target.